The night started off with receiving a nametag of someone in a famous couple, and a playing card cut in half. The objective of the event – find your “other halves” by going around and talking to everyone until you meet. After having been successful in finding our “other halves,” we were rewarded with INSA accessories: ties and scarves. This activity engaged all of the students to meet almost everyone in the school at least once, and to forge some great conversations and new friendships. Adding the welcome drink and music into the equation created an atmosphere where it was easy to feel relaxed and free, being able to hang out with the friends we’ve already made while continuously meeting new students from other programs, or students we see on a regular basis but just awkwardly pass in the hallway. 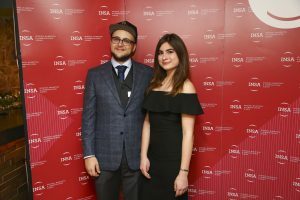 Personally, I had a really great time dancing, and generally enjoying the mood of the party with my friends here at INSA. I greatly appreciate the opportunity I got to meet many students whom I haven’t spoken to or even seen around the school before, and began developing new connections with them. 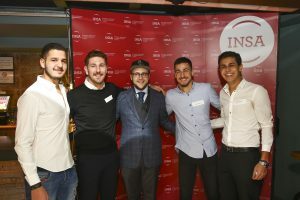 I started to create my own established network of both students and teachers here in Barcelona thanks to this annual party, all while being able to enjoy myself and the company I was in.